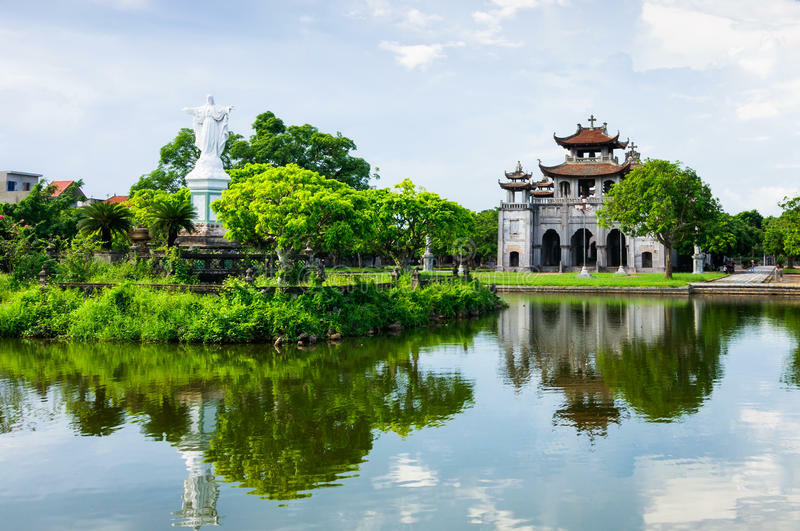 Phat Diem Cathedral is a complex comprising of a lake, a cathedral, a stone church, Phuong Dinh (bell house) and three artificial grottoes. At first sight, visitors are easily attracted to square lake on the main road to the cathedral. In the middle of the lake, there is a small island with statue of Jesus Christ. 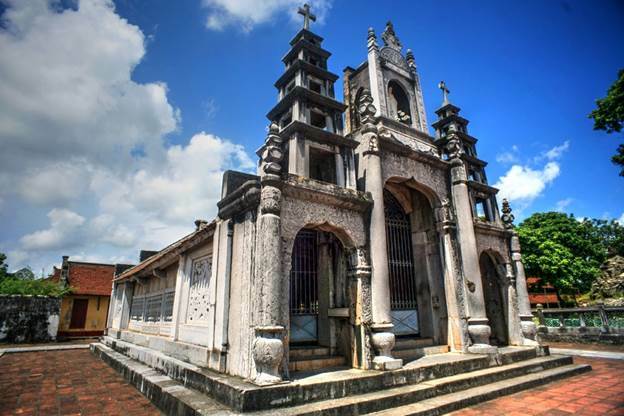 This is one of the most famous and beautiful churches in Vietnam with special architecture: an elegant combination of Western architectural style and Vietnamese religious buildings. It took 24 years to build this church from 1875 to 1898. And as its name suggests, it was built of stone and wood that are readily available in the mountain area of Ninh Binh. The preparation phase, mainly extracting materials from limestone mountains, took the locals as many as 10 years to finish. 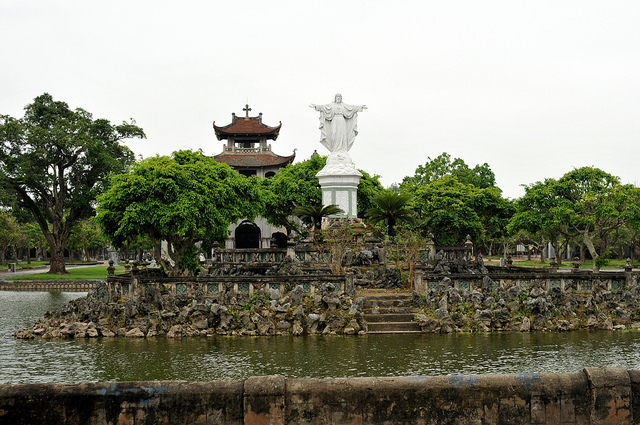 Phat Diem Cathedral is a complex comprising a lake, a cathedral, a stone church, Phuong Dinh (bell house) and three artificial grottoes. At first sight, visitors are easily attracted to the square lake on the main road to the cathedral. In the middle of the lake, there is a small island with statue of Jesus Christ. 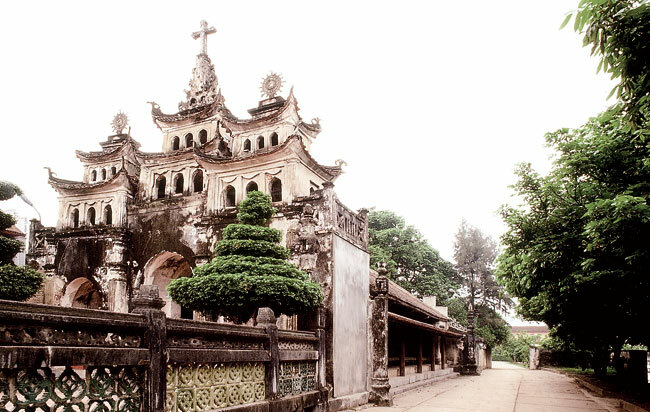 Phuong Dinh easily becomes the next eye-catching monument, with stone carvings on both sides of the walls. It is 25 m high, 17m wide and 24m long with three stories. The first floor is covered by large green flagstones. The middle and upper floors house a large drum and a big bell respectively. 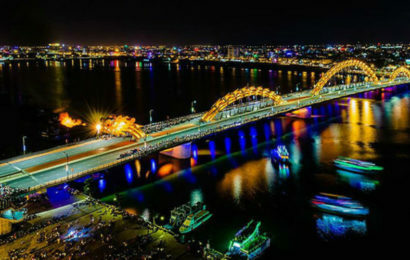 As visitors leave Phuong Dinh, they will see a great cathedral which was built in 1891 with the official name “Nha tho Duc Me Man Coi”. The cathedral is 74 meters long, 21 meters wide and 15 meters high with four roofs. It was built of six rows of ironwood. Within the cathedral are four small churches of different styles. 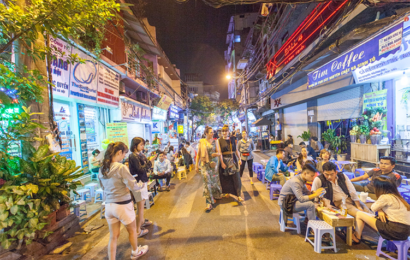 Next to the grand cathedral is a church named “Nha Tho Trai tim Vo Nhiem Nguyen Toi Duc Me” . But people usually refer to it as “Stone church” because its walls, pillars, ground, bars and beams are made of stone. 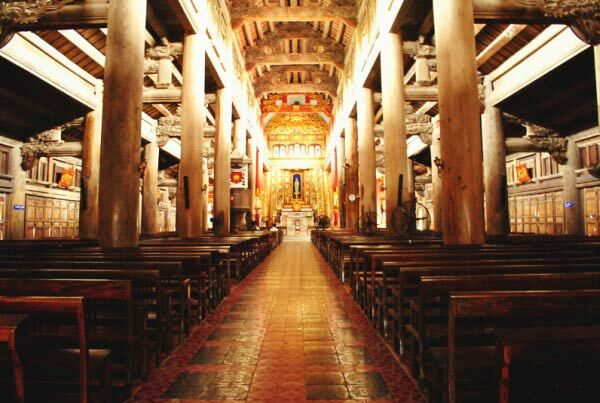 The inside of the church has many sophisticated carved reliefs, with chrysanthemums, bamboo, fir trees and apricot trees that symbolize four seasons in a year. Around Phat Diem Cathedral, there are a lot of beautiful stone caves and artificial mountains. 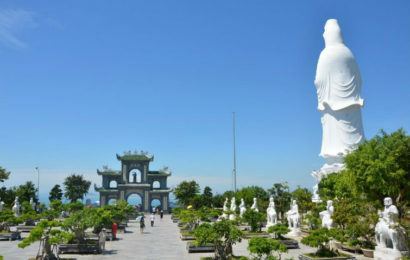 In Ninh Bình, you can come to one of the most famous and beautiful pagoda is Bai Dinh Pagoda. 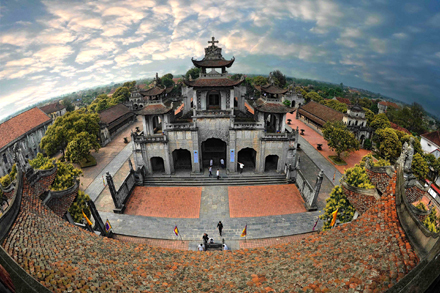 With artistic design and skillful technique, Phat Diem Cathedral is the pride of many Ninh Binh people.